Having gotten a hold of Resident Evil: Retribution (which I have never seen) I am excitedly going back through the previous ones. Hot on the heels of Apocalypse comes my review of Extinction. Boy this is such a better film than that one. Several years after Apocalypse and the measures used to contain the T-Virus outbreak in Raccoon City have drastically failed. 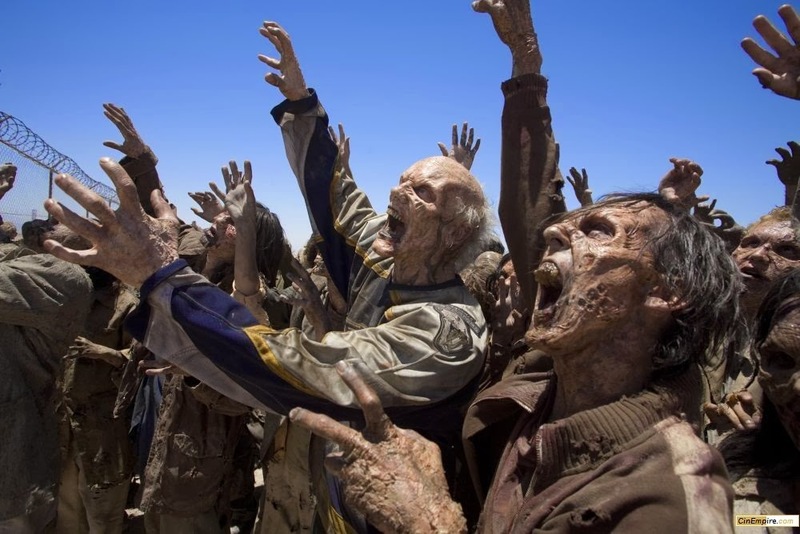 The T-Virus swept the Globe turning the majority of humanity into brain dead zombies. The virus even affected plant life, killing off vegetation, soaking up the oceans and turning everything into a desert wasteland straight out of Mad Max. Survivors live a nomadic life, forever on the move as to stay in one place will result in annihilation at the billions of hungry ghouls. 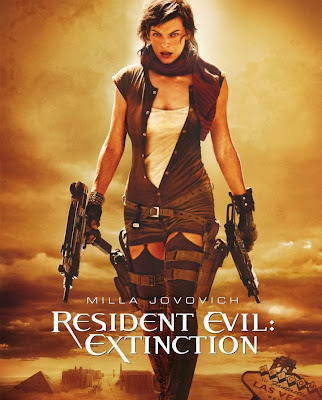 Alice (Milla Jovovich) has been travelling alone, worried that the evil Umbrella corporation are still after her and so not wanting to put her friends in danger. Meanwhile her friends have joined a convey led by Claire Redfield. 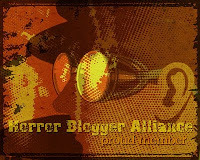 Their paths cross once more, though unluckily for them just as the North American branch of Umbrella (hiding out in a bunker) once again locate Alice and send some new creations out to get her. Extinction is straight up a good film, no patch on Resident Evil for sure but entire worlds better than Apocalypse. For one thing zombies have been given the care and attention they deserve, these zombies look ancient and weathered and yet are actually centre stage rather than badly edited background creatures. For this film they wanted to make the goriest Resident Evil yet and they succeed, plenty of blood and guts. Alice's nemesis the zombie dogs yet again show up and are most welcome, while joining them and the zombies are a new undead foe; crows. I love the sequence with these, right out of Alfred Hitchcock's 'The Birds' and a great ending to that sequence. For fans of the games a Tyrant type character is later introduced (though with shockingly bad looking CGI effects) and for fans of modern zombies (I.E: fans of running rage zombies) there is a new threat for Alice and chums to face. The desert setting lends itself well to the Resident Evil universe, I love the idea that a zombie virus could make grass itself undead in a fashion and the souped up monster slaying vehicles of the convey as well as the apocalyptic dress wear give the film a consistent theme. Leaping ahead to years into Armageddon was a brave move and one which really pays off. The Umbrella compound swarmed by hundreds of zombies was a heavy nod to Romero's finest hour; Day of the Dead and the wire frame map effect were a welcome nod to the first film, thankfully ignoring the style that Apocalypse puked out. The special effects in the CGI sense as I said are terrible (CGI tentacles sadly extremely fake looking) and also quite bad are the characters and their acting abilities once again. 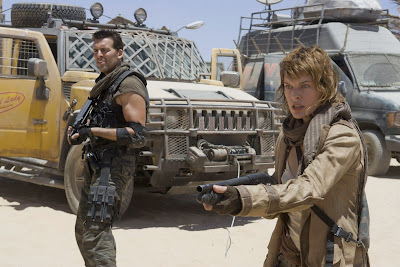 Returning from Apocalypse are comedy character C.J and male lead Carlos, they are not so bad this time, though a new annoyance is Ali Larter as Claire who seems uncomfortable in her role and the new side characters such as 70's looking Otto and sniper cowboy Chase are pretty flat and terrible. Albert Wesker makes an appearance thanks to Jason O'Mara but is very bad and with zero screen presence, no wonder they replaced him for Afterlife. Mention must go to Iain Glen as main bad guy Dr Issacs (who had a bit part in Apocalypse). The plot is not bad, there is reason for the actions everyone takes, and an excuse for events to happen, the sequences at the Umbrella compound are very enjoyable with some great shout outs to locations from Resident Evil, including a fantastic fake opening that had me thinking for a moment I had accidentally put the wrong film on. This does everything right that Apocalypse failed at, a far better attempt and as a zombie horror it works, yes I said horror, not action!